Once in a while you will face problems with your website such as blank pages, broken forms, PHP errors, etc. Which is a situation that may make you panic at the beginning; in most cases the solution is easier than you think. In this post you will learn how to troubleshoot some of the common problems. Try fixing the bug to gain more experience with Joomla. 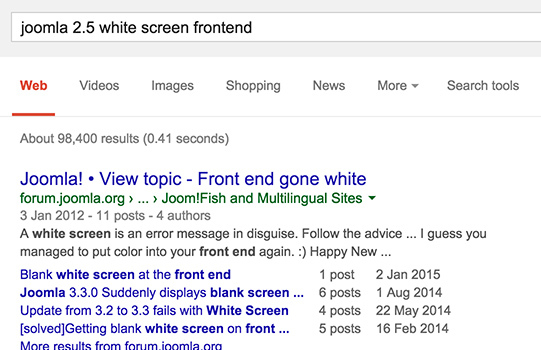 Start by doing a search in Google. If somebody already faced the same error and shared the solution it will save you time. Use keywords; start with “joomla” + details of the problem. 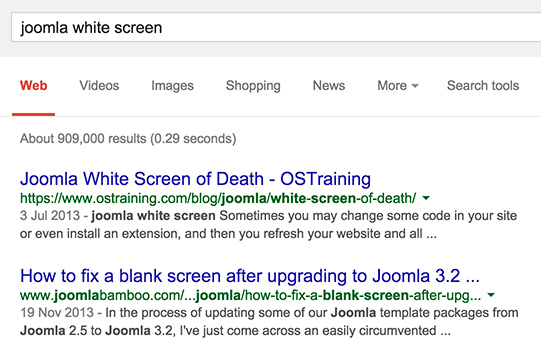 By searching “joomla white screen” we can reach many tutorials and threads with possible solutions. Read carefully the suggestions people provided on those sites. If possible, do a backup of your site before applying any. Be aware that the solution could or could not be similar for any version of Joomla. It is high priority to have Joomla and all your extensions up-to-date. For Joomla, go to Components > Joomla Update; for any third party extension go to Extensions > Extension manager > Update. Apply any listed update, clear cache and refresh your site. It is possible this step is all that you needed. When something in your site is broken and we don’t have any idea what it can be, it is good practice to confirm if the heart of the CMS is healthy. Install it like you do with a regular extension. This will restart the core of Joomla and resolve the problem if it was related to those files. For all the sites that looks fine or not, it is worth checking the directories and file permissions. Directories must be: 755, files: 644. Having something different can put your site at risk. Use an FTP client like FileZilla or CPanel to fix permissions. People who use Joomla before the version 3 arrived will understand what it means. A common issue is load jQuery more than once from different locations like the template and a module. This is one of the situations that may result in a broken dropdown menu, slideshow, gallery, etc. Below you will see a log report, check if any is pointing to an error related to a third party extension. Ask for assistance to the developer by providing the details you discovered. Having a white screen with no errors makes it impossible to know what’s going on, it is required to know the error behind that empty page. Go to System > Global configuration > Server. Set Error reporting to maximum. Go back to the white page and refresh, hopefully you will see an error. Do a search in Google using that information. If you are not able to troubleshoot the issue, the next step is to ask for help in the forum, post your concern with a very short and clear explanation. The more clear you are with your words the better somebody will help you. Basically include Joomla version, extension involved and the error if there is any. Provide as many possible details, only saying “my website is not working” is pointless. Remember the forum Support is just a matter of information, not panic messages. It is important to mention the people who will assist you in the forum are volunteers and they will do their best to help you. Be polite, patience and thank them for their guidance.